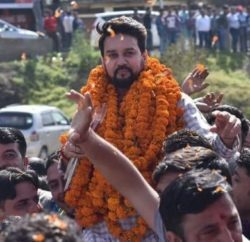 Bhartiya Janta Yuva Morcha (BJYM) national president and Hamirpur parliamentarian Anurag Thakur launched a national-level signature campaign in favour of BJP’s Prime Ministerial candidate Narender Modi from the Anu Chowk, Hamirpur, by signing on a banner. Anurag Thakur was accompanied by the BJYM activists and also raised slogans in favour of Modi for more than an hour in which girls also participated. Speaking on the occasion, Anurag said, “This campaign will be undertaken throughout the country and BJYM activists will obtain signatures on huge banners to mobilise support for Modi.” This drive would continue till September 20 after which these would be submitted at the Central office in New Delhi. 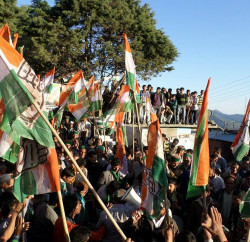 Anurag Thakur is hoping to get over a one crore signatures in this campaign. 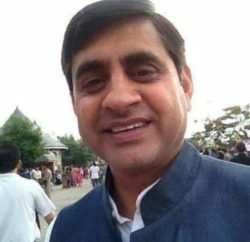 Thakur has appealed the youth to participate in the campaign and obtain maximum signatures in support of Narender Modi.